Land governance is at the center of development challenges in Cambodia, Laos, Myanmar and Vietnam. Governments are revising land policies and practices in order to face these challenges. The project aims to (i) assist the emergence of more favorable policies and practices for securing the rights and access of family farmers to land and natural resources; and (ii) to strengthen the effectiveness of concerned stakeholders through learning, alliance building and regional cooperation. 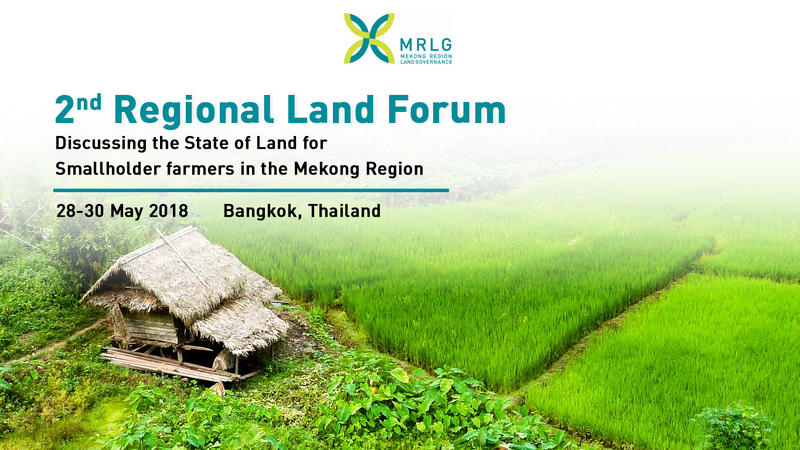 Organized by the Mekong Regional Land Governance (MRLG) project and the Food and Agriculture Organization (FAO) of the United Nations, the Second Regional Land Forum will take place in Bangkok, Thailand from the 28-30 May. Moderated by Kalpana Giri from RECOFTC, the panel on "Land Governance and Gender" featured a diverse round of gender experts discussing the inseparability of gender equality and good land governance. With talk of gender more prominent than ever, the session was certainly an interesting and poignant way to close out day two of the Forum! Sophorn Poch, Director of the Independent Mediation Organization (IMG), gives us some insights into his involvement with the Second Regional Land Forum as well as his hopes in terms of the Forum's outcomes. "While agricultural output and exports are growing in the Mekong as a result of the concessions, the benefits have not reached smallholders and indigenous people"
Issues related to effective Land Governance remain at the centre of development challenges in Cambodia, Lao PDR, Myanmar and Vietnam (CLMV) and thus it is essential for governments in the region to turn their attention to associated practical, legal and policy issues. Within this context, the MRLG project since 2014, has been working with FAO and a broad range of partners to contribute to improved land governance policy and practice. The MRLG project is currently in transition between the completion of its first Phase 1 (June 2018) and the commencement of Phase 2 (July 2018). Key findings from the recently concluded End of Phase 1 Review identified that continuing government engagement will be essential if MRLG is to achieve its stated aims and objectives towards improved land governance policy and practice during Phase 2. With the specific focus on ‘policy influencing’ for Phase 2 and the joint activities with FAO, and with the dual objective of exposure to the wider land governance debate and the provision of an opportunity to share knowledge and learning, MRLG and FAO (as co-hosts of the event) invited esteemed colleagues and officials to the Second Regional Land Forum. At the conclusion of our First Regional Land Forum, there was a call to hold a second. The Second Regional Land Forum was an opportunity for expert discussion, knowledge sharing, policy dialogue and action planning on key land governance policies and practice, with emphasis on the rights of smallholder farmers in the Mekong Region. The central goal of the Second Regional Land Forum was to provide a multi-stakeholder platform for networking and dialogue on land governance issues specifically related to responsible agricultural investment and customary tenure. It is perceived (as was the case during the first forum) that as a regional conversation, the sensitivities that lie at country level can be more openly discussed. What was the specific objective of the Forum? Bring together land governance stakeholders in the Region to showcase knowledge products and success stories, solutions and results, particularly from Phase 1 MRLG activities as well as other relevant independent activities of partners over the past 4 years. Facilitate an exclusive round table policy dialogue on regional large-scale land investments and customary tenure recognition issues with government officials presenting key results and pointing to key debate topics. Showcase pilot initiatives of MRLG partners to donors working on land issues in the Mekong to instigate funding opportunities for our partners.